...the number one reason why people don't change is pride, closely followed by hating the consequences of sin but actually still loving the sin itself. If you're frustrated at your inability to change, then your first step is to give up - to give up on yourself. Repent of your self-reliance and self-confidence. Your second step is to rejoice in God's grace - his grace to forgive and his grace to transform. The other reason we don't change is because we really don't want to. We may certainly hate the consequences of our sin, but we don't truly hate the sin itself. I know that's often easier said than done, but here are three principles that might help. Whereas the last chapter I blogged on (almost a month ago) was on the truths that we need to turn to, this chapter is on the desires that we need to turn from. Remember, behind every sin is some kind of lie. That's why we need to go back to truth. But that's just a part of it. As we turn to God, we are in effect turning away from sin. Chester writes, "We sin because we desire or worship idols instead of worshipping God" (99). When we think of idols we usually think of some type of shrine or statue. But an idol is anything we look to to give us meaning and satisfaction. The Bible says that our first sin wasn't choosing idols. It was rejecting God (Jeremiah 2:12-13; Romans 1:25). And then, because we rejected God as the source of ultimate satisfaction, we had to look elsewhere. And that's where idols come in. It's important to remember that an idol doesn't have to be something bad. It's normally something good. What makes it an idol is that we believe that if we don't have it, our lives are meaningless, and though that doesn't sound too harmful, it is in essence us saying that God is not enough. And that's why Chester says that changing behavior is not enough. Instead, change will come as God transforms our hearts and gives us new desires (102). This of course is something that only God can do, but we do have a role to play. We are called to repentance. As I wrote earlier, repentance involves turning. Turning from idols and turning to God. The tragedy is that we've been led to believe that repentance is something that we do once in our life, at the point where we first turn to Christ. In truth, repentance should be a daily occurrence. It is the constant battle against sin which we fight daily - the refusal to allow the eye to wander, the mind to contemplate, the affection to run after anything which will draw us from Christ. I feel myself getting bitter. Once I might have fed my desire by reflecting on all the wrongs I endure. But I realize now that bitterness is grumbling against God's goodness. And so (in my best moments and with God's help) I try to stop it before it grows. As you can see, on one hand this sounds pretty simple. But on the other hand it takes intentionality and requires that a new habit be formed. Once again, we go to the Gospel. Paul says in Galatians 5:1 that it is for freedom that we have been set free. That is how we have the ability to form new habits. I've become a big fan of using the "Smart Playlists" function of iTunes. Several weeks ago I read an article from Lifehacker that gave me the idea that I'm using right now. I use a 4-star system and a 5-star system. I created a smart playlist that compiles any song with five stars and that hasn't been played in the last week. This playlist is labeled "Best Songs." They're songs that I don't mind hearing anytime. I then created a second smart playlist that compiles any songs with four stars and that hasn't been played in the last month. These are my "Better Songs." I have a lot of songs with four stars now. I don't rate anything with one, two or three songs. Rating songs takes a long time. I use the Remote app to rate songs when I'm at home, and I love the fact that I can also rate songs that are on my iPhone. My old iPod didn't have this feature. I created one more Smart Playlist to help with this as well. It compiles songs with no stars and that hasn't been played in the last month. I also used some other parameters so that it would not include podcasts or audio books. As I go through that playlist I can rate songs, which will then move them to my primary two playlists. Dropbox is another great productivity tool I've been using. It basically provides two great services, both of which are free. First, it serves as an offline backup system. I backup my files to a partitioned hard drive at least once a week using Syncback. But I've learned that backing up everything "off-site" is smart as well. Second, it's a great way to sync files with multiple computers. Here's how I'm using it. The primary files I work with on a daily basis are in four different folders on my laptop: Neighborhood Church, Property Management, Real Estate, and Household. Instead of having them in the "My Documents" folder, I put them in the "My Dropbox" folder. I can work on a file, then, when I save and close it, it backs it up and syncs it. Then I can open the Dropbox app on my iPhone and read those documents (no edit function yet). I can also open, read and edit these documents on other computers. If you'd like to check it out, go here. We'll both get extra storage space. A few weeks ago I preached a sermon on how to discern the root cause of, for lack of better words, "bad days." We have a few options to choose from. For this post I'll cover the primary ones. First, there is the crystal clear teaching from the Bible that all Christians will suffer. It is a part of maturing in Christ. The Bible says that because of this, we can rejoice in our suffering (Romans 5:3-5; James 1:2-4). The second option is spiritual warfare. Now I realize that some readers of this blog may get a little concerned when they see this term. There are two extremes when it comes to spiritual warfare. The first is to give Satan way too much credit. Those who fall in that extreme see Satan behind everything bad that happens to them. The other extreme often comes about as a result of the first extreme, but I am learning that it is equally dangerous. That extreme is to not give Satan enough credit. The Bible says that Satan is like a roaring lion, roaming around and seeking someone to devour (1 Peter 5:8-9). I don't know about you, but I find that to be a very powerful image. We have an enemy, and his ultimate desire is to destroy us. I've made it a habit to get away for prayer and study several times a year. My place of choice is now St. Columba's Episcopal Retreat Center. Yesterday afternoon I left my house around 4:00. The plan was to get there around 5:00 and leave today around noon. I stopped at Wal-Mart in Raleigh to get some food for my time there, and when I got back out to my car to leave, it wouldn't start. I was pretty sure it was the battery. It ended up turning into quite an ordeal, of which the specifics I'll spare you. But three hours later, I decided that going home would be the best bet. Over a Frosty and burgers at Wendy's (and I might add that I do believe in Wendy's tagline that a Frosty will always make a frown go away), Mandy and I talked about this topic. Why did this happen? Is there a reason? Was it a time of testing, in which I was supposed to press through and still go? Was it the work of our enemy? I was, after all, carving out a day for prayer and study? I guess it would make sense that he wouldn't like it? Or is that giving him too much credit? Was it just a matter of my battery going dead? Was it simply coincidence? As you can see, times like these yield lots of questions. It seems that over the last two months I have had lots of times like these. Again, I won't go into all the details, but it has been a trying time. Now, of course, it could be worse. I am a very blessed man, and I never want to take these blessings for granted. But I also want to be honest and say that yesterday was very frustrating. More importantly, I want to respond appropriately to these ordeals. After all, I'm called to embrace suffering, but I'm not called to embrace the enemy's work. I'm called to resist him. That's a big difference. So here's what I'm learning. In the moment, my job is to cling to truth. What do I know about God? What do I know about myself? That is so key, no matter the root cause. If it's suffering, I remind myself that God is sovereign and that I'm his beloved child. I remind myself that I can rejoice in the ordeal, knowing that God is going to use it to make me more like Jesus. And if it's spiritual warfare, I remind myself that God is bigger, that Satan is ultimately defeated, and that I don't have to fear. I can resist. I remind myself that if this is the work of my enemy, then I can rejoice in the fact that he is in some sense threatened by what God is doing in my life. It all comes back to truth. But here's where I need to grow. It's one thing to know how to respond in the moment. It's another thing to know how to prepare beforehand. This is what Mandy and I talked about over the yummy Frosty. We need to ask our key leaders at Neighborhood Church to pray for me when I'm getting ready to take this type of retreat. Sounds so simple, yet it is something that I neglect all the time. The bottom line is this. I ultimately can't control what happens to me. My battery went dead and I had to replace it. Otherwise, I would still be sitting in the parking lot at Wal-Mart. But my God is faithful. I'm in my office instead of a cabin in the woods, but regardless, I want to seek Him today. That I can control. And I pray that God would use my weakness and dependence as an opportunity to do what only He can do in my life, and I also pray that He might use this as an encouragement to you. In April I discovered a crack in my foundation wall. The issue was erosion in my flower bed. Rain gushes off my roof in one place and had been washing out the flower bed. So this weekend the boys were in Munford, and we got to work. We started around 11:00 on Friday and worked until 7:00 (with a brief break to go and help my dad build a trellis for Taylor's new house). All work and no play is no fun, especially when there are no kids, so Mandy and I went to the Levitt Shell after that. The next morning we worked from 9:00 until 2:00, then went to Taylor's birthday party and then Megan's graduation in Jackson. Finally, Sunday morning we worked for a few more hours planting flowers, pruning bushes, mowing and edging. I'm still quite sore, but the results do make me quite happy! Mexico was awesome! Celebrating 10 years of marriage with Mandy was awesome! Sitting on a beach for hours at a time, not having to worry about kids or jobs or chores or schedules was awesome! Now, that's the last time I'll use the word "awesome" in this post. Promise. The resort we were staying at (The NOW Riviera) was so nice (is that word better?). We were there for eight days, and we only left one evening to do some shopping. Here are a few pictures. I have to say that I'm not used to that many days without work. It took me a couple of days to really unwind, and by the end of the trip I was ready to be home. Note that this primarily had to do with missing Adam and Micah, but I also was ready to get back to work. I was refreshed. I will congratulate myself by saying that not once during our time there did I check email. That's right...not once. Mandy and I got to go on a lot of dates during our time there. Several of the restaurants were semi-formal. Most nights we got to get all dressed up, walked on the beach to the restaurants, and had such great food with equally great service. I am thankful for the week away, and am even more thankful to have been able to share it with the woman that I love! Mandy just called me. She was going through some papers and found a paper that Adam brought home a few weeks ago. Below is what she found. 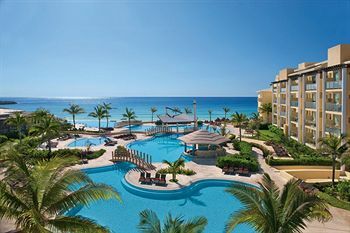 On Wednesday morning Mandy and I are flying to Cancun. 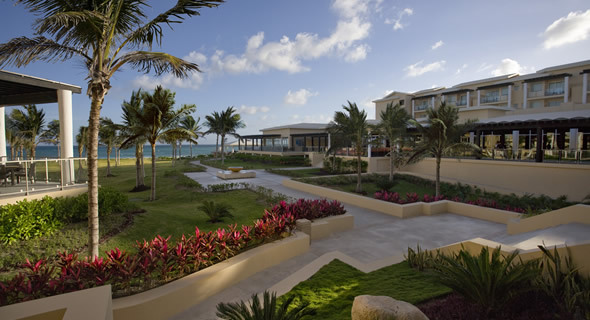 We're staying at the NH Riviera in Puerto Morales, which is just south of Cancun. I booked this right before Christmas, so we've had a long time to anticipate. The plan is to drive to Paducah tomorrow afternoon, drop the kids off with the grandparents, and drive to St. Louis. We'll spend the night there, and fly out at 6 am. Seven days later we fly back. That's right - 7 Days!! !